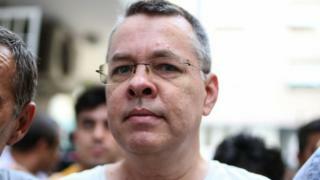 Image caption US President Donald Trump has called Pastor Andrew Brunson "an innocent man of faith"
US President Donald Trump has insisted he will not back down in a standoff with Turkey over a detained US pastor. "I think it's very sad what Turkey is doing," he said. "I think they're making a terrible mistake. There will be no concessions." He said he had thought Turkey would release pastor Andrew Brunson after the US helped persuade Israel to free a detained Turkish citizen. Mr Brunson denies allegations he was in a plot against Turkey's president. Mr Trump has imposed tariffs on imports of Turkish steel and aluminium in response to President Recep Tayyip Erdogan's refusal to free Mr Brunson. The US president brushed aside concerns that the row between the two Nato allies could cause serious economic damage in Europe and emerging market economies. "I'm not concerned at all," he said in an Oval Office interview on Monday with Reuters news agency. "I'm not concerned. This is the proper thing to do." Mr Brunson has been held in Turkey for nearly two years over alleged links to outlawed political groups. The diplomatic spat has worsened a crisis for Turkey's currency, the lira, which has lost about a third of its value against the dollar since January. This has stoked widespread selling in other emerging markets, sparking fears of a global crisis. On Monday, Mr Trump demanded Mr Erdogan release Mr Brunson in exchange for the Turkish prisoner freed by Israel. "I got that person out for him," Mr Trump said. "I expect him to let this very innocent and wonderful man and great father and great Christian out of Turkey." Turkey has urged Washington to hand over Fethullah Gulen, a Turkish cleric in the US suspected in a coup plot against President Erdogan, but the US has refused.